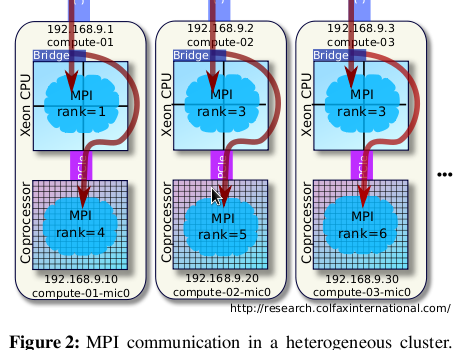 Complete paper: Colfax_Heterogeneous_Clustering_Xeon_Phi.pdf (443 KB) — this file is available only to registered users. Register or Log In. Source code for Linux: Heterogeneous_Asian_Options.tgz (7 KB) — this archive is available only to registered users. Register or Log In. In this paper, we promised to benchmark the Asian Options application with Infiniband. Sorry about that! Please try again. I bought a xeon phi for mistake, I thought it is just a normal cpu or GPU that I just need to put in the PC and that will work. Is that any possible to run it with other software or it sure use you own code? Xeon Phi is a specialized high-performance parallel processor for computing applications. In its first generation, Xeon Phi has the form factor of a PCIe device, similarly to a GPU. However, unlike a GPU, Xeon Phi is not for graphics processing, but for computing workloads (although specialized graphics applications for Xeon Phi do exist). Whether or not you can use Xeon Phi with a certain application depends on whether this application has specific support for Xeon Phi. However some computational workloads (e.g., LAPACK and BLAS functions in Matlab or R) can take advantage of Xeon Phi automatically (see, e.g., the 3rd webinar here).